In the present time, we are facing the three most terrific technologies that havethe ability to take us to a new level. One of them is based on the sense, Internet of Things, another is about the brain, Artificial Intelligence and last is all about fuel, Big Data. The combination of these three can take a business to the next level. However, the main question comes, what will happen when two of them are combined. 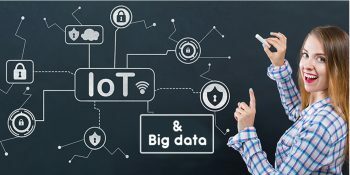 We all have heard a lot of buzz about IoT and Big Data relationship in the IoT Application Development. So, let us have a brief about both the sides of a single coin. The present world is completely data-driven that is helping in analyzing and coming up with the most accurate technologies. However, the data is extracted at such a large volume that it is difficult to handle manually. This data can be used with the Big Data and IoT combination that is leveraged by the industry. Hence, it is crucial to understand the basic relationship between the two of them that binds both of them. It is clear that data is something that is consistent in both technologies. It holds a lot of value in terms of the unstructured and structured format in the Big data Services. The large among of data cannot be processed easily and requires conventional techniques for data processing. This makes it depend on three major keys such as Velocity, Volume,and Variety. This divides the volume of data into smaller unitssuch as petabytes, terabytes, exabytes, etc. It returns to the variety that explains the data nature that is processed at a velocity to work in real-time to achieve insights. These three aspects of data depend internally on each other that makes it possible to integrate big data with natural processing language, machine learning,and business intelligence. It will also correlate the penetration of different data analysis to make it work in an efficient manner while increasing the value of the application. IoT –This is the latest advancement in terms of data processing. It helps in obtaining the real-time flow when the internet is connected to all the appliances. To get an insight, this connection can easily sense the presence or mood of an individual to automatically take actions. This technology is used by the IoT App Development Company to decrease energy usage and be consistent in the manner of switching. The digital devices are connected to the physical device with non-internet features which are used on a daily basis. This will give interconnectivity of the devices to obtain proper exchange and collection of data to keep track of performance while controlling and monitoring commands. Even the sensors are used to get primary means of data collection via objects and devices for analyses purpose. There is no doubt that different techniques are used in order to store and collect data. One of the major aspectsof data collection is IoT that makes it easy to work upon several workflows. This data collection can be achieved with the help of the collection and processing of data in a large quantity. It can be achieved with the help of different connection techniques for IoT that makes data collection easy. The connection helps in the collection of large amounts of data with the top Big Data Solutions as per the behavior of appliances. This is mainly done with the help of traffic lights, sensors, etc. that are connected to IoT in real time. This provides productivity and improvement in terms of data safety and working routine. Also, the connected objects work well in terms of different fields that makes it convenient to extract data. There is an integrated system inthe NoSQL database, big data and IoT data that makes industries to depend on IoT Application Development. It has come up as a new frontier that makes companies work on extraction process to make it recognizable. Also, the legal entities are also understood by such advancement that makes it easy to work on data processing. Thecommunication and data detection can be done easily with the help of such advancement. In the internet world, there are different perspectives that are included in the system that makes it easy for objects to work on anactive role. The receiving and sending of data play a vital role that makes it easy to make decisions. There is no doubt that the integration done by Big data Services of Big Data and IoT has a huge impact on a number of things. This holds a lot of value in marketing strategies that make it efficient to work with. The integration in the application has a huge role in the engagement of customer and client. This has made it possible for companies to work with the advancement as per the strategies that take it to the next level. The motive to do so is by making it fast and easy in terms of size. The IoT App Development Company can incorporate it amazingly well to ensure that the system or dynamic nature is maintained. This can be achieved with the help of customer experience that will be automatically customized for product promotion. The customer will only receive updates or ads which are preferred by them. The advancement in technology has taken us to a new format of mobile experience in today’s world. It is becoming essential to connect IoT and big data in such a way that the mobile application can enhance the experience of the customer and work upon the different aspects such as mobile payments. There is no end to understand the IoT and Big Data influence on the market. The essential thing is that it is necessary to make sure that Big Data Solutions are to the mark with product and customer.